Commercial leases are leases signed between business and the owner of a property which the business is interested in leasing. Such contracts often outline the terms and conditions under which the owner agrees to let the business occupy the property to carry out activities that are in connection with the functioning of the business. A long term commercial lease is one that is signed for a period of a year or more. 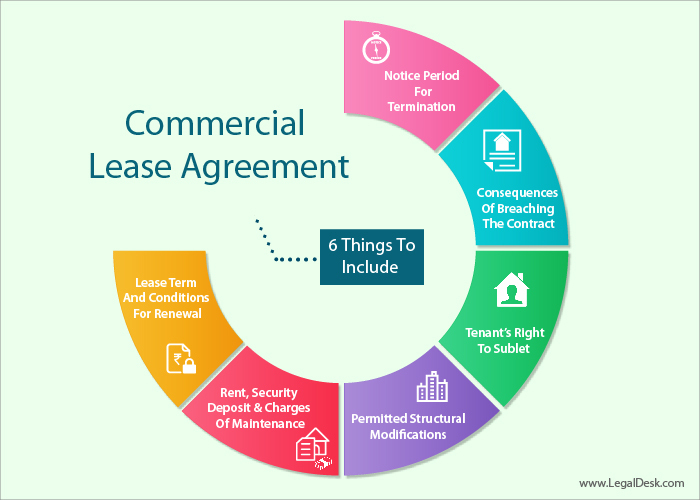 How To Prepare A Commercial Lease Agreement? As opposed to residential leases, the format of commercial leases are non-uniform and no standard format is ever followed. As the requirements vary from business to business it is difficult to stick to one particular format. Before the contract is drawn up, the owner and the business representative must discuss the requirements at length and lay down the terms and conditions so that future disputes are avoided. Most commercial leases allow modifications to be made in the structure of the building, and this too must be included in the contract. Commercial leases signed for long periods of time often involve up front payment of a lump sum. This amount and any other payments made must be clearly spelled out in the contract. What Should Be Included In A Long Term Commercial Lease? The contract must be carefully prepared with no loopholes that leave room for disputes in future. The prepared contract must then be printed on stamp paper of recommended value. Both parties, the owner and the representative of the business must place their signatures on designated places. The signatures of two witnesses are also required. The deed must then be notarized at a Sub-Registrar Office and the required stamp duty must be paid. If you wish to prepare a long term commercial lease agreement, we’re more than happy to inform you that we have a pre-drafted, lawyer verified, comprehensive template available on LegalDesk. This way you can create on from the comforts of your home and save time and money. Go ahead, give it try. Create a long term commercial lease right now!! !